The 13th letter of the Hebrew alphabet is mem. The shape of the letter represents the waves of water, and the name is directly related to the word for water מים - mayim. There is some debate as to whether or not the word mayim should be viewed as a plural. Steinberg writes that the singular form is mai מי - although the word never appears in that form. There are two forms in the construct state (smichut) - mei מי or meimei מימי . Ibn Ezra, as quoted here, says that mayim is a dual form plural. In post-biblical Hebrew we find the plural of mayim - meimot מימות. The letter mem alternates with other labials - bet, nun and peh. Klein writes that mem works as a substantive prefix - it creates nouns or noun equivalents. It can create nouns - מדע from דע (knowledge), places מאבוס from אבס (storehouse), and instruments מגן from גנן (shield). Mem is also added to piel verbs in the present tense (e.g. מדבר midaber - speak). This can lead to confusion about the proper pronunciation of some more modern words. For example Almagor-Ramon writes, although it is an instrument, the correct pronunciation of refrigerator מקרר in Hebrew is mikarer, not makrer, for the Academy of the Hebrew Language gave it the name based on the action it does. 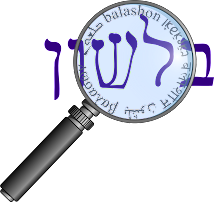 On the other hand, the proper pronunciation of computer מחשב is machshev, not michashev, for the formation of its name is due to it being an instrument. The name Noach נח is connected to the three letter root נחם .